Jakarta, Indonesia – Royal Philips (NYSE: PHG, AEX: PHIA) Indonesia today officially announced its pilot-project in collaboration with local hospital group Bundamedik, the city government of Padang and the Ministry of Health, to address the increasing concern of maternal mortality in Indonesia1. The one-year "Mobile Obstetrical Monitoring" (MoM) project will remotely monitor pregnant women for early high risk identification via a new telehealth solution. "We aim to address fatality amongst pregnant women during pregnancy, which is just one part of our broader vision to use our innovative technology solutions in making healthcare more accessible. As a technology company that cares about people, we aim to build on our 100 years of history in research driven innovation," said Ronald de Jong, Chief Market Leader, Royal Philips. Approximately 96% of the world population has access to mobile phones2. Philips has developed a prototype scalable telehealth platform which can be adapted to suit specific rural and urban needs, using a mobile phone application. With this app, midwives can build a relevant health profile of pregnant women by collecting data from physical examinations and tests3 at local nursing clinics or even at the soon-to-be-mother’s home. Through the integration the local risk score guidelines, Philips aims to support obstetricians or gynecologists to determine if a pregnancy might be high- risk, in which case immediate and adequate help can be provided4. Philips also helps to increase access to maternal care in other regions across the world where remote monitoring is involved, such as in India and Africa. In Uganda, Philips in collaboration with ‘Imaging The World’ has trained midwives in village health centers to scan and acquire ultrasound images that are compressed and sent to a specialist center. A recent joint study demonstrated that providing pregnant women in rural Uganda access to ultrasound screenings resulted in a near-doubling of newborns delivered by skilled health care workers. By introducing the new MoM project in Indonesia, in the first three months of the pilot over 60 out of almost 500 soon-to-be-mothers have been identified as having a high risk pregnancy by doctors using the app. These beneficial results were achieved with the engagement of six midwives from six different community health centers (Puskesmas). Dr. Ivan Sini, SpOG, Chairman of PT Bundamedik and Indonesian Reproductive Science Institute (IRSI).said, "The high maternal and fetal mortality rate remains one of the biggest challenges for the healthcare system in Indonesia, with the lack of access to health services and professionals such as skilled doctors or midwives a key contributing factor. The Philips MoM project is a great example of a strategic collaboration between the private and public sectors working towards improving the overall healthcare access to women and children in Indonesia." 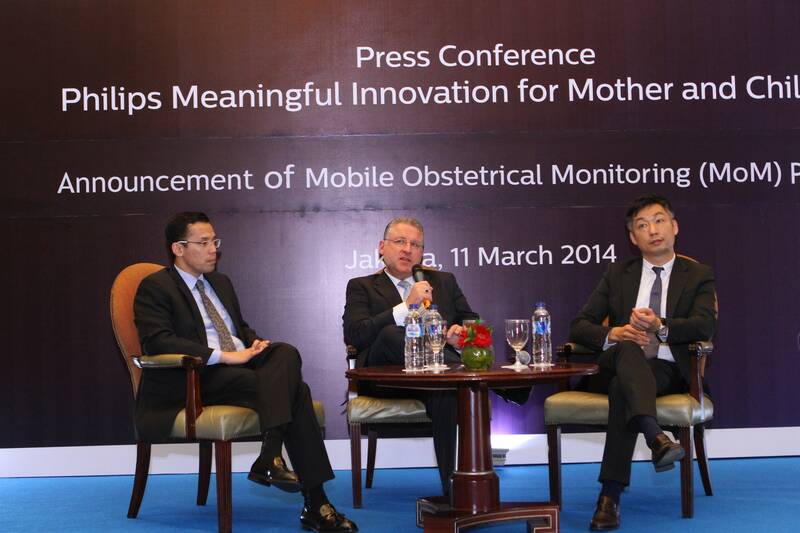 MoM is part of the ongoing "Philips Innovation for Healthier Indonesia" program focusing on Mother and Child Care. This program also includes expanding coverage and clinical education, in which Philips aims to train, educate and coach 3,500 medical professionals this year in order to help increase the level of medical standards in the country. 1 Indonesia struggles with one of the highest rates of maternal and fetal death in the developing world. The Indonesian Demography and Health Survey in 2012 showed a drastic rise of Maternal Mortality Rate (MMR) to 359 from previously 227 per 100,000 surviving births, only five years earlier. This is largely attributed to a lack of access to quality healthcare for soon-to-be-mothers. 3 Physical examinations on blood pressure, weight, and fetal movement, as well as tests such as blood sugar level, urine protein and more are uploaded by the app onto a central server, together with information of their medical history. This enables obstetricians or gynecologists to remotely monitor patients from the hospital or at their home anytime and anywhere, via mobile phone app providing a patient snapshot. The doctor reviews the patient’s data and assigns or reassigns the risk level for further follow-up/referral decisions. No diagnostic decision is allowed to be made based on the health data viewed by the doctor on his mobile. 4 The doctor reviews the patient’s data and assigns or reassigns the risk level for further follow-up/referral decisions, such as ultrasound examinations or fetal monitoring. No diagnostic decision is allowed to be made based on the health data viewed by the doctor on his mobile.